Has Apple's new iPhone hit the limits of industrial design? Has Apple reached the limits of industrial design? The next iPhone is going to look amazing. This is as close to a truism as you get in the tech industry—it’s sort of like predicting that Warren Buffett will make smart investments, or that the next Judd Apatow movie will feature fart jokes. But now we know it for sure. On Monday morning, Gizmodo revealed that it had the new device in hand. (The site apparently purchased it from someone who found the supposed prototype in a Bay Area bar.) The gadget blog says it spent a week poking and prodding the phone and believes there’s no doubt about the device’s provenance. Yes, in the greatest breach of Apple’s vaunted security that anyone can recall, the next iPhone has leaked. But that’s what makes the big reveal such a letdown. Sure, the new phone looks good. But that’s only because it looks pretty much the same as every other iPhone—not to mention just about every other phone on the market today. If Gizmodo’s phone is the real deal—and I believe it is—it proves what I’ve long suspected: The iPhone has reached the limits of industrial design. The first iPhone was a breakthrough because it replaced nearly every physical button with a touch-screen. It didn’t conform to any standard notion of what a phone should look like—which, of course, is a hallmark of thrilling design. Since then, though, the iPhone’s looks haven’t thrilled. Apple has put out three models since 2007—the original, the 3G, and last year’s 3GS—and each one has looked nearly identical to the last. The new one continues this trend. In a way, this is a credit to the company’s original vision—the first iPhone was so perfectly realized that changing it would ruin what makes it so great. The touch-screen is a fixed element of its design; for at least the next decade, you can expect the front of every new model to be dominated by a flat sheet of glass, the same as on every previous model. The iPhone’s overall shape is also set in stone. Make the device any bigger, smaller, longer, or wider, and it wouldn’t fit as well in your hand and your pocket. What’s left to tinker with? Not very much. Apple can mess around with the phone’s edges and its back, and it can alter the device’s thickness or weight. 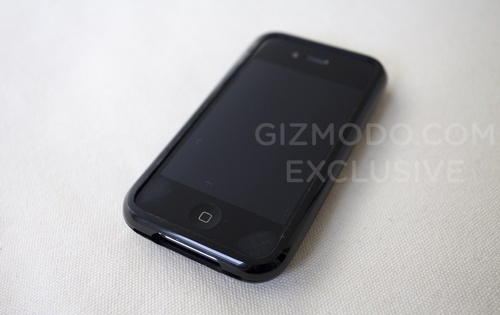 These are exactly the kinds of small changes we see in Gizmodo’s pictures. The gadget blog describes the new iPhone as “drastically” different from today’s model, but that only highlights our diminished expectations. From the front, the main difference is the phone’s sides; today’s iPhone has curved edges, while the one Gizmodo has is boxy. The new phone has a bigger battery than today’s model, and it’s got two cameras rather than one (a second front-facing camera lets you video-chat with your friends), all of which makes it 3 grams heavier than the 3GS. Apple has also redesigned the phone’s back. The other side of today’s iPhone is made of a curved slab of black plastic. The new one is flat and seems to be composed of a glasslike ceramic of a type that Apple once disclosed in a patent filing. The other changes are even tinier—there are two separate volume buttons instead of one, and the slot where the phone’s SIM card sits has been moved from the top to the side. Overall, nothing about it is revolutionary. The new iPhone looks just like what you’d expect it to look like. Indeed, it’s telling how Apple disguised the phone to let it go out on the street—in a protective case that makes it look just like today’s iPhone. I’ve seen a lot of chatter online about the new design: Some people think it’s brilliant; others think it’s ugly as sin. What I haven’t seen is an understanding that most people will stick the phone inside a protective case, just as Apple did with this prototype phone. And when you put the old iPhone and the new iPhone in a plastic cover, they look nearly identical. Gadgets, of course, aren’t all about looks, and the new iPhone’s same-ish exterior doesn’t tell us much about the gadget’s interior. Nevertheless, this can’t be good for Apple. No company gets more mileage out of industrial design; People like Apple’s devices not just for what they can do, but for how they look and how they feel. The irony of the iPhone is that by making a device that’s essentially just a screen, Apple has leveled the design playing field. The iPhone’s most dominant design feature, its screen, can be replicated by every one of its rivals. Compare the iPhone to Google’s Nexus One or the Motorola Droid. Sure, they’re not identical, and you probably like one of the three phones more than you like the others. But it’s hard to say that any of these phones stands out as being any more awesome-looking than the others. No other Apple gadget looks as similar to its rivals’ product—you wouldn’t ever mistake an Apple laptop, keyboard, mouse, or desktop for a Dell. But can you guess what someone’s using if they’re sitting across the room and fiddling with a touch-screen phone jammed into a protective case? Sure, maybe if you’re a gadget nerd. But most people wouldn’t know the difference—from the back, in a case, the next iPhone will look the same as today’s iPhone and will be pretty much indistinguishable from a Nexus One or any other similar rival. To be sure, Apple can compete in areas other than looks. The iPhone’s user interface still beats that of its rivals, and Apple recently announced that the new version of its OS will add support for multitasking, bringing it up to par with Android and Palm’s WebOS. There’s also the App Store—Apple can still claim that there are more apps for the iPhone than any other phone. These are all important considerations, but they’re not whiz-bang showstoppers. A revolutionary industrial design will get people drooling for the iPhone; multitasking support won’t do that. Or am I wrong? Can you think of any way to improve the look of the iPhone? Tell me your ideas in the comments section below. Don’t be surprised if Steve Jobs steals them, because as it’s going now, Apple is in need of some inspiration.